The objective of this deck is to dish out huge middle columns every turn with guard restriction where your opponent is unable to guard with grade 1 and above. This means Sentinels are pretty useless and are dead cards for your opponent when having a match up against this deck. The rules to play this deck is quite Simple. As simple as 3 Steps. Soul Charge Rapidly and accumulate as many souls. Preferably at least 6 by turn 3. Subsequently to 10 and then 15 souls. Stride. Try to dish out the main threat. Gilles de Rais ASAP. Open criticals early game and late game. Go for the kill. Break ride Echo of Nemesis over Dantarian to go for the kill if all other options Failed you. Pretty Simple isnt it? 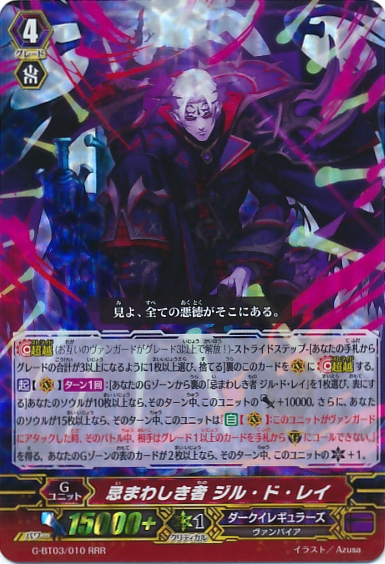 [ACT](VC)[1/Turn]:[Choose a face down card named "One Who is Abhorrent, Gilles de Rais" from your G zone, and turn it face up] If the number of cards in your soul is ten or more, this unit gets [Power]+10000 until end of turn. Then, if the number of cards in your soul is fifteen or more, until end of turn, this unit gets "[AUTO](VC):When this unit attacks a vanguard, until end of that battle, your opponent cannot call grade 1 or greater cards from hand to (GC).". If the number of face up cards in your G zone is two or more, this unit gets [Critical]+1 until end of turn. This is the bomb in the deck. For a simple condition of having 15 souls, he is able to deal 2 criticals with a meaning 36k power without boost is great. Your opponent would have to guard 40k for 2 trigger pass. Not to forget we have triple drive for a G4 stride units. 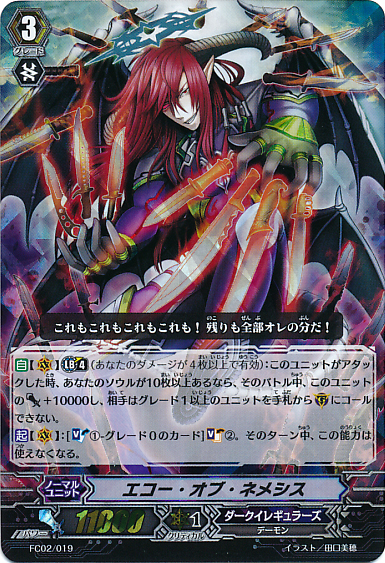 Having a guard restriction makes it fantastic and need not having to pay any counterblast makes this card a total badass that kills your opponent instantly. This totally puts our notorious Bluish flames to shame. 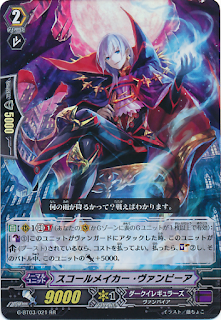 [AUTO](VC) Limit Break 4 (This ability is active if you have four or more damage):When this unit attacks, if the number of cards in your soul is ten or more, until end of that battle, this unit gets [Power]+10000, and your opponent cannot call grade 1 or greater units from hand to (GC). [ACT](VC):[Soul Blast (1)-grade 0 card] Soul Charge (2). This ability cannot be used for the rest of that turn. This card is your backup finisher in cases where Gilles De Rais can't end the game for you. 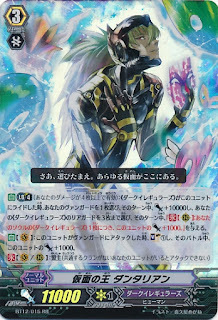 Its a great utility card where you can soul blast unwanted grade zeros to gain soul advantage. It has an easier condition to have its guard restriction of 10 souls which makes it a decent backup finisher. Having it to breakride would be enough to hit magic numbers of at least 31k. Your opponent would have to throw 30k (10k shields worth) to guard him for a 2 trigger pass. Another Notorious Card not to mess with either. [AUTO] Limit Break 4 (This ability is active if you have four or more damage):When a «Dark Irregulars» rides this unit, choose your vanguard, and until end of turn, that unit gets [Power]+10000 and choose up to three of your «Dark Irregulars» rear-guards, and until end of turn, those units get "[CONT](RC):This unit gets [Power]+1000 for each «Dark Irregulars» in your soul.". [AUTO](VC):When this unit attacks a vanguard, Soul Charge (1), and this unit gets [Power]+1000 until end of that battle. Dantarian would be the best option to ride on grade 3. It can be a beast when break ride over. Giving Vanguard +10k and rearguards +1k for each card in the vanguard's soul. Which helps end the game when you ride a nemesis over it. [AUTO](RC) Generation Break 1 (This ability is active if you have one or more face up G units in total on your (VC) or G zone):[Counter Blast (1)] When this unit attacks a vanguard, if this unit is boosted, you may pay the cost. If you do, Soul Charge (2), and this unit gets [Power]+5000 until end of that battle. Squall Maker Vampir has a neat effect that helps build up soul consistently every turn. He allows soul charge 2 every turn and +5000 making him a 15k guard column which effectively drain 2 cards from your opponent's hand. Compared to our Amon's Follower, Psycho grave, his ability is not once per turn and is automatic every turn whenever he is boosted to attack an opponent's vanguard which allow consistent building of souls. A pretty neat card engine to farm soul advantage and set up for the final turn. 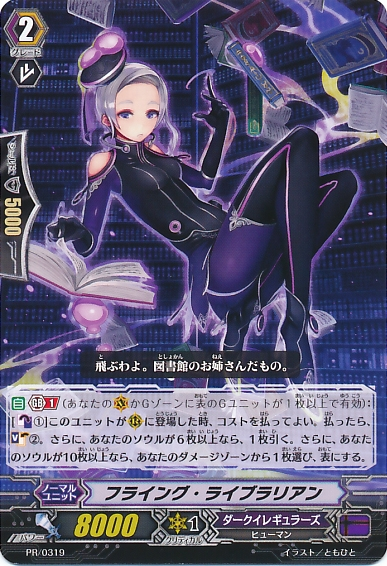 [AUTO] Generation Break 1 (This ability is active if you have one or more face up G units in total on your (VC) or G zone):[Counter Blast (1)] When this unit is placed on (RC), you may pay the cost. If you do, Soul Charge (2). Then, if the number of cards in your soul is six or more, draw a card. Then, if the number of cards in your soul is ten or more, choose a card from your damage zone, and turn it face up. That's all I would need to explain. The rest are self explanatory. Do stay tune for more.